60′ from the front door to the walkover leading to the white sand beach and Atlantic ocean. The Bohemian is all about total enjoyment with minimum effort on your part. Catch the sun, sea view and breeze from the 46′ x 10′ deck or cool off in the backyard pool surrounded by windswept oaks. 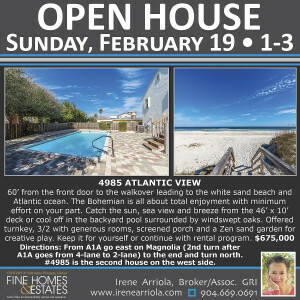 Offered turnkey, 3/2 with generous rooms, screened porch and a Zen sand garden for creative play. Keep it for yourself or continue with rental program. $675,000. Directions: From A1A go east on Magnolia (2nd turn after A1A goes from 4-lane to 2-lane) to the end and turn north. #4985 is the second house on the west side.